Both my boys’ junior league teams made the football playoffs this year. 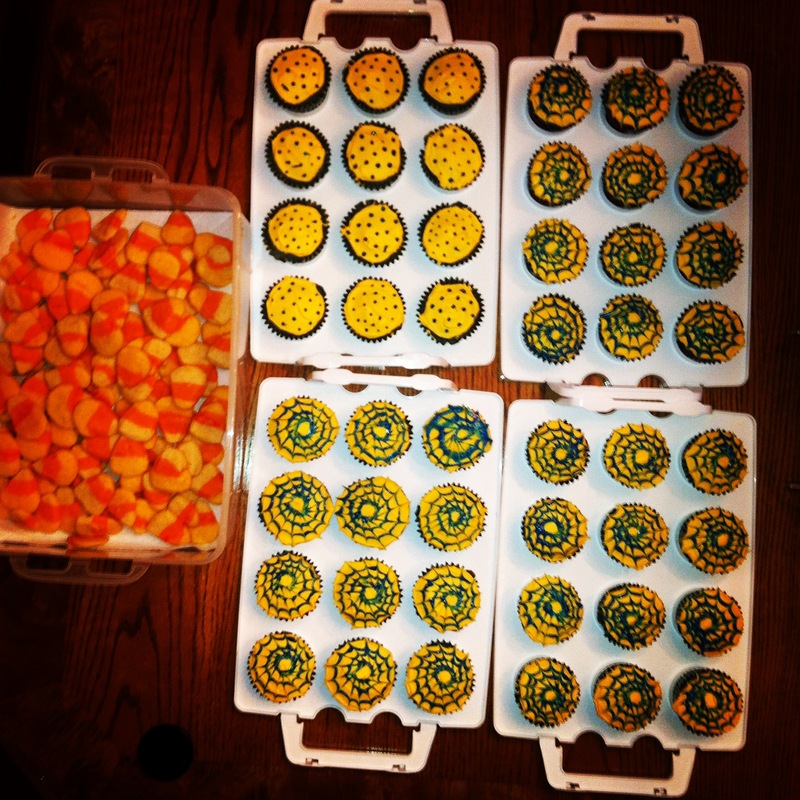 As is my tradition, I make goodies for the boys after each playoff game, with the hope that we make it to the SuperBowl. The first of the playoff games on the way to the SuperBowl fell on Halloween. Cupcakes are the easiest thing to make in terms of individual treats and I decided to decorate them in team colors (royal blue and gold), but with a spooky look. First I made candy melt spider webs in yellow (one of the team colors). 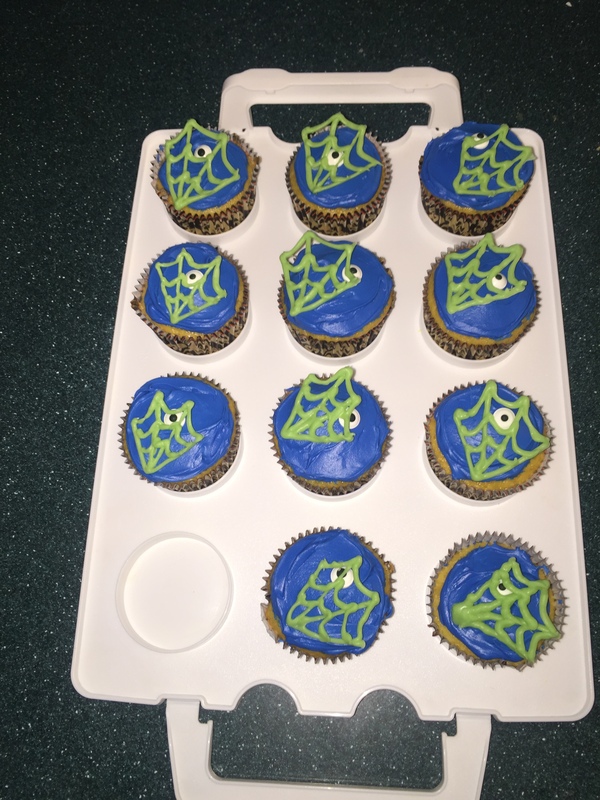 I also made extra cupcakes for the fans at the games and created vibrant green candy melt spider webs. I only made the “half web”, not the whole web. 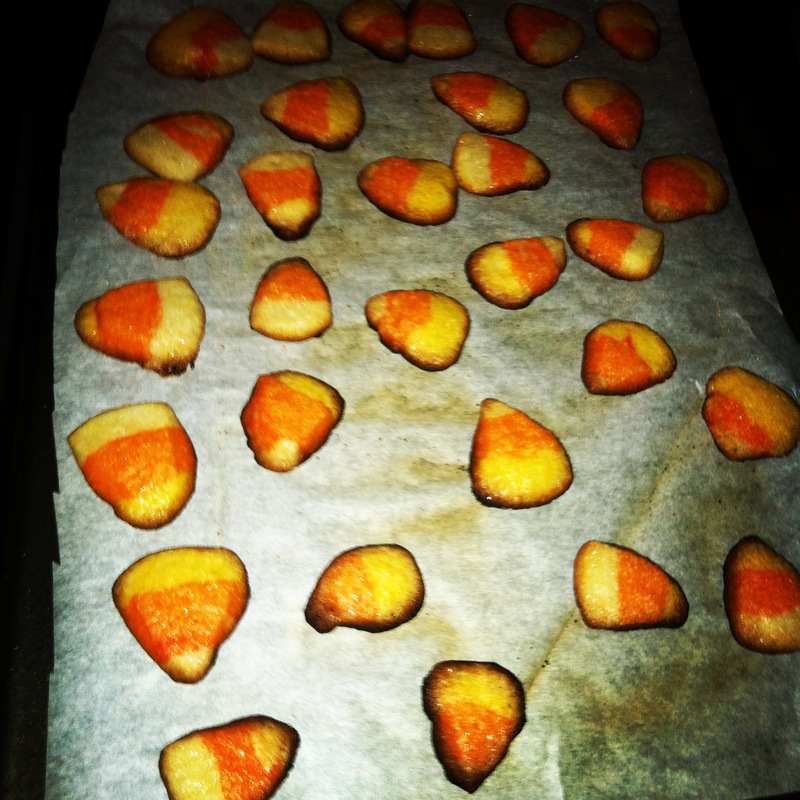 As the spider webs were setting, I added sugar sprinkles in gold on top of the yellow ones. 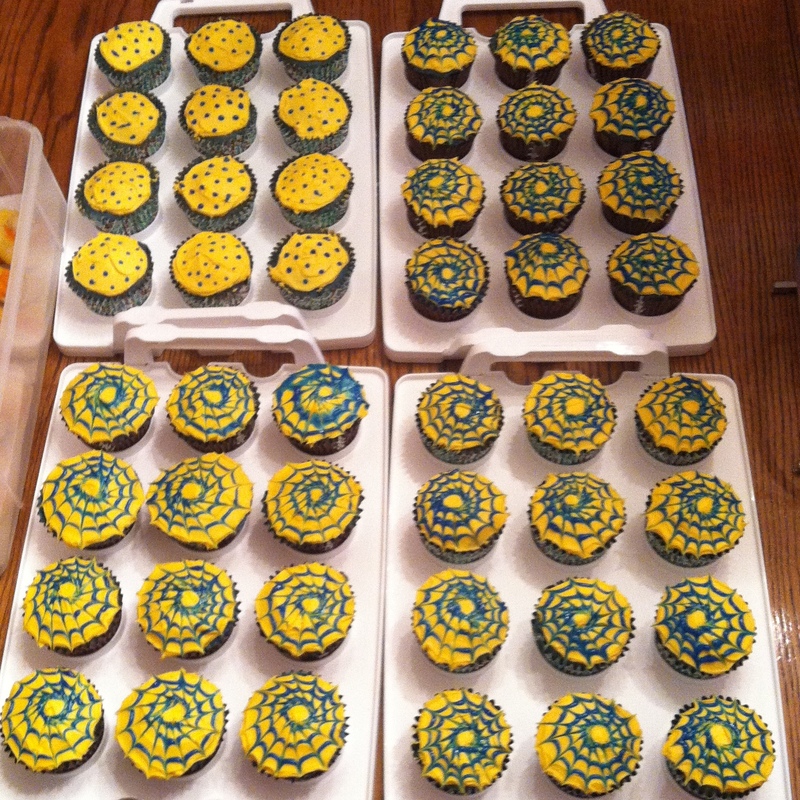 The cupcakes were a simple yellow cake box mix. I dyed the icing using royal blue dye. I used a 1A tip to pipe on a “monster” and used sugar eyeballs. I then added on the spider webs I had created. 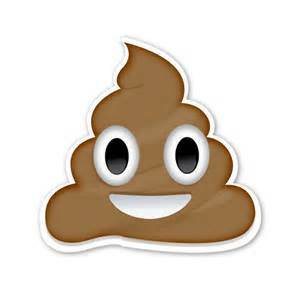 I thought, what 12 or 13 year old boy wouldn’t love a cupcake decorated to look like poop? Here are the two trays (there were exactly 24 players and coaches). 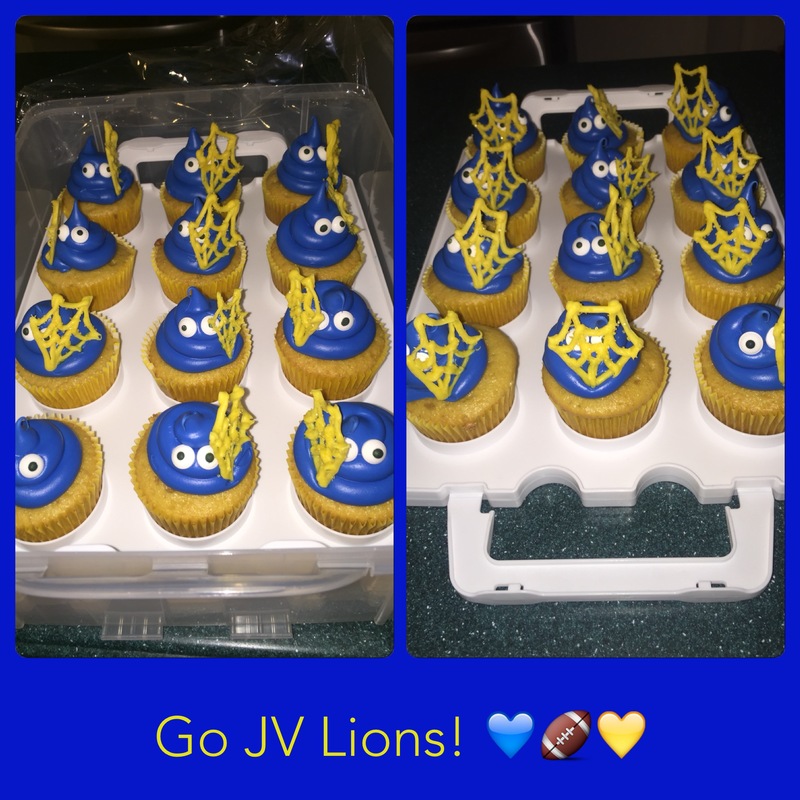 I also made additional cupcakes for the fans and families in attendance because I had a feeling this would be the last game for the JV team. They were up against the top seeded team. And I was right; they lost the game and their season came to an end. For the varsity team, we were the #1 seed in our quarterfinal game. We had come off an undefeated season and expected to make a run through the two playoff games on our way to the SuperBowl. I planned to make more elaborate creations once we got to the semi-final and then the SuperBowl. 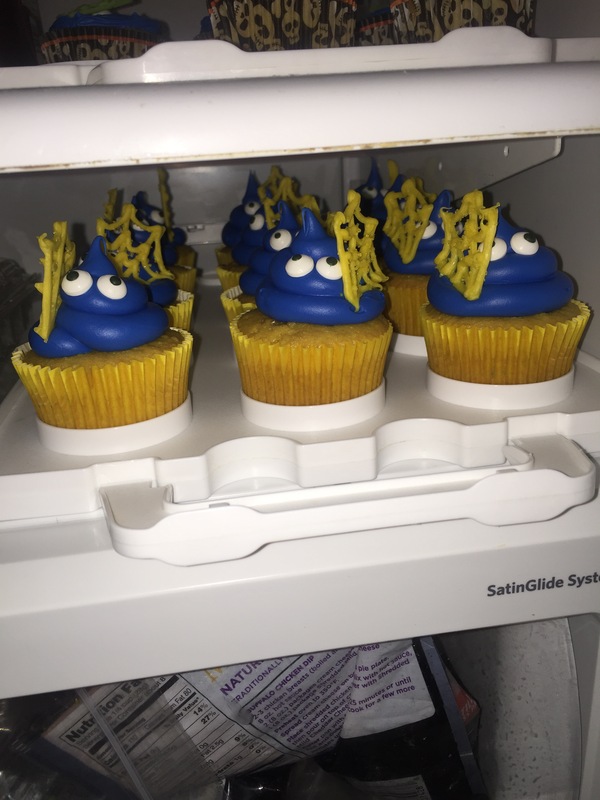 Full disclosure – I also ran out of royal blue dye and wouldn’t have had enough frosting to make more poop emoji monsters, so I just covered the top of the cupcakes with some frosting, the candy eyeballs, and a yellow spider web candy melt. But for my son Alex, his teammates, and coaches, the road to the SuperBowl ended that day. It was a sad day for the boys, but I have had the honor of watching them become fine young men over the past six years. While the ending wasn’t so sweet for either of my boys’ teams this year, I’m grateful to have good boys, with good friends, who play on good teams to cheer for. It’s that time of year my co-workers look forward to — holiday after holiday when I fire up the oven to try new recipes and celebrate. 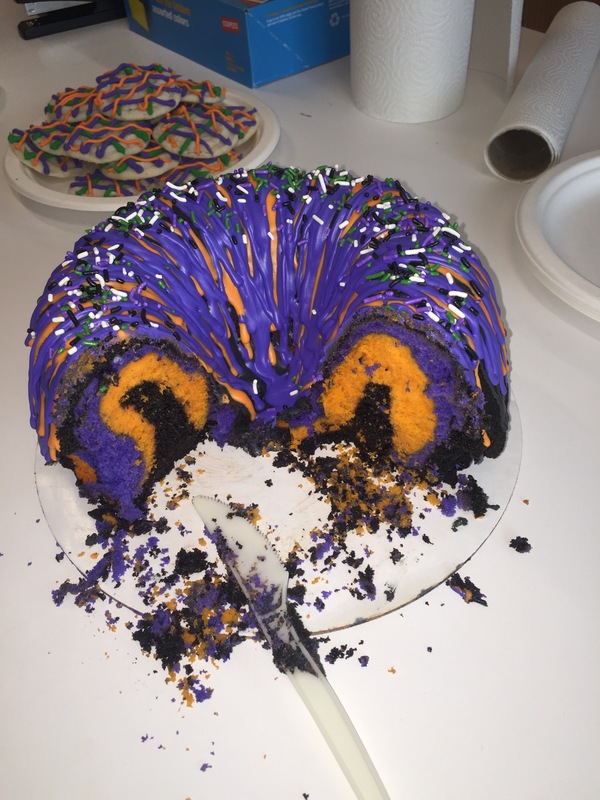 For Halloween this year, I made a Halloween raindbow party cake. The recipe and instructions for this cake are pretty simple (if you can get past the silly costume she’s wearing in the video). When it comes to the main cake batter, I make 6 cupcakes from that. It leaves enough batter to complete the “rainbow” cake, without having it climb over the side of the bundt pan while it’s cooking in the oven. I used a chocolate fudge cake mix for the main batter and added in a bit of black coloring to darken it. The white cake mix I separated and dyed orange and violet. 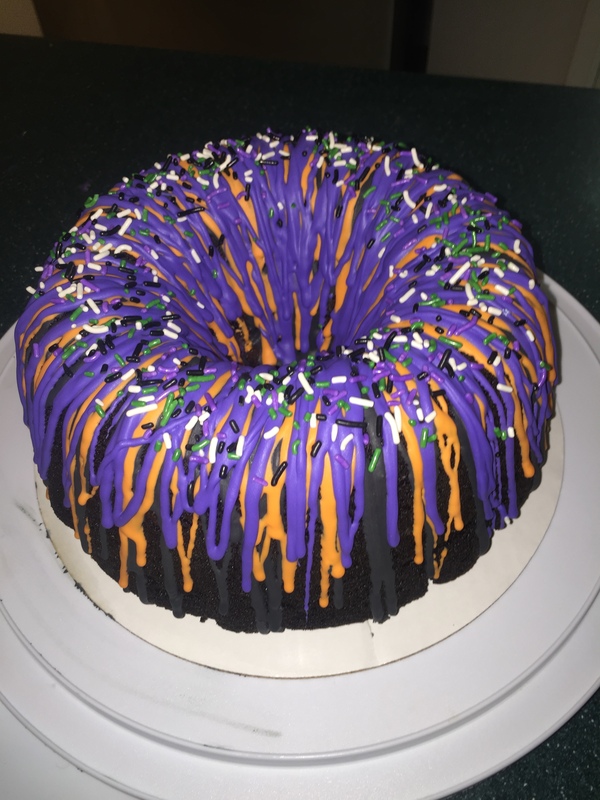 I dyed the icing black, orange, and purple. 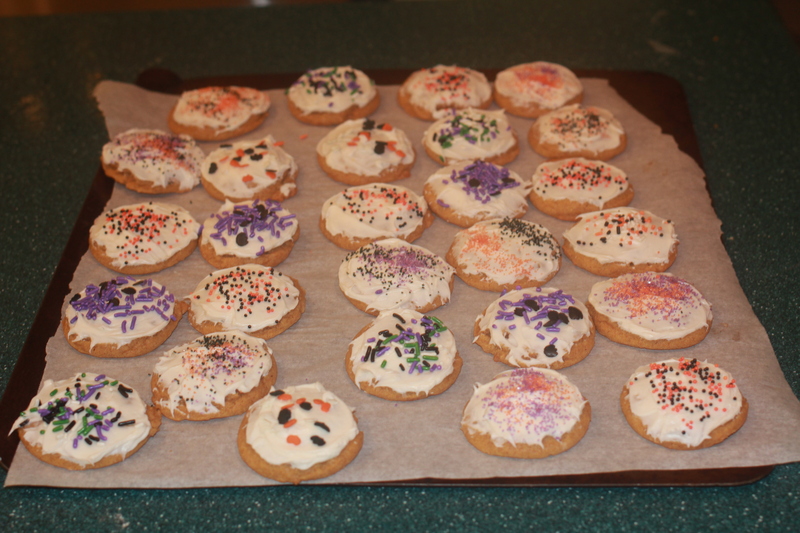 I topped it with some Halloween-colored jimmies (the ones second from right in the product photo). This cake looks different every time you make it, depending on how the batter is poured in and settles during baking. I’ve also made this in a version with color schemes for Christmas (red, green, white), Easter (yellow, pink, light purple), Winter (two blues and white with peppermint extract in only 1/3 of one of the icing colors because it is so strong), and breast cancer survivor (white, light pink, hot pink) versions. This cake is great for school colors also. Baking time: I find this cake takes about 45 – 50 minutes to bake. Bakers note: I always add a tablespoon of vanilla to box mixes to make them taste a bit more homemade. I also substitute canola oil for vegetable oil because — to me — the cake is more moist and light. Then, there were the sugar cookies with royal frosting. To help save time, I used refrigerated cookie dough. I made royal frosting, separated it and dyed it orange, kelly green, and violet. I love using royal frosting, but it is messy. I end up with it all over myself! 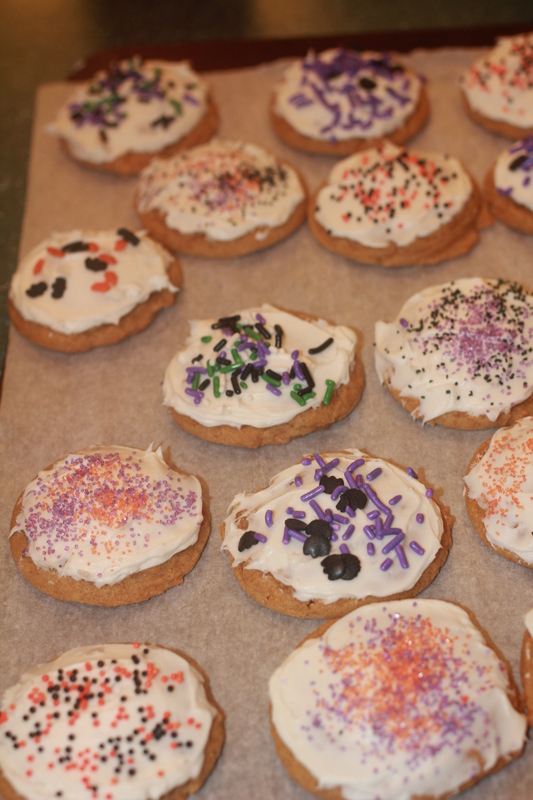 And it took most of my Sunday to decorate so many cookies (approx. 84). 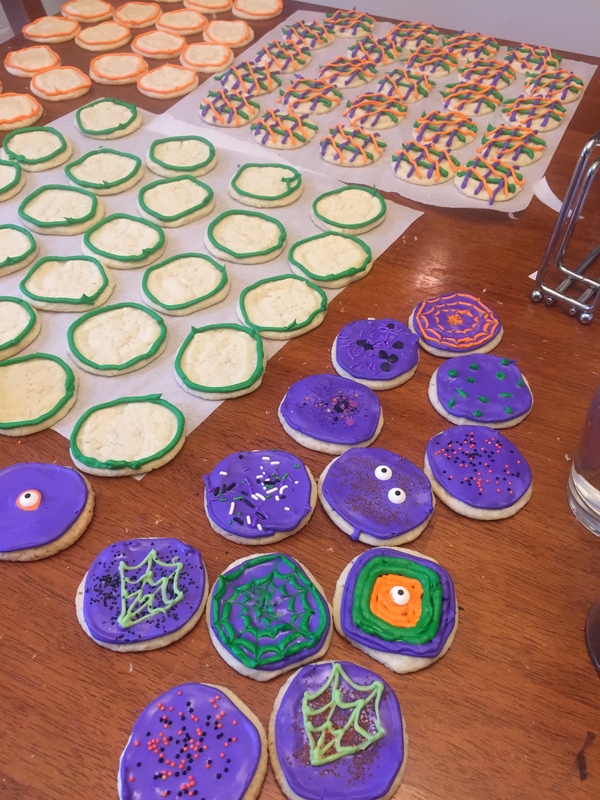 Some cookies completed – so many more to finish up! Here are the cookies, with a fairly unique design for each one. The exception are the plaids — I didn’t have as much frosting as I thought and worried I wouldn’t have enough to “flood” every cookie. I used Halloween themed jimmies, sugar sprinkles, and candy eyeballs to decorate the royal frosting. This year, my older son’s football team made it to the playoff round on the way to a possible Super Bowl game for the youth league he plays in. 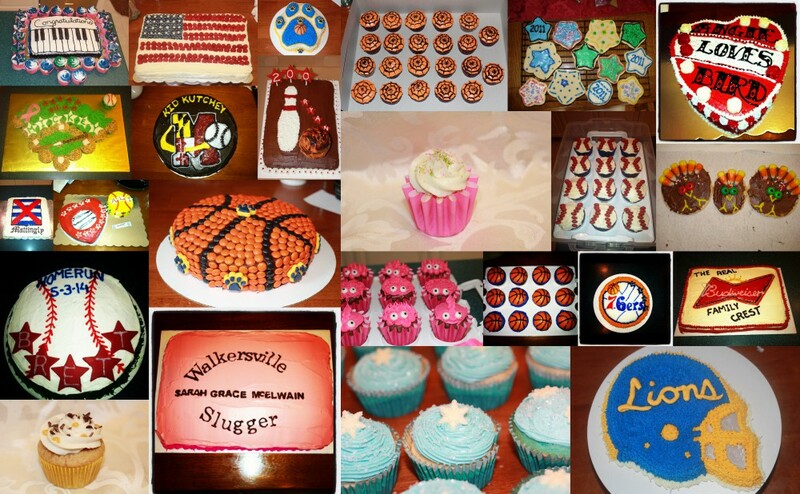 The first round of playoffs was November 1, so I decided to make Halloween-themed treats for the players, coaches, and family/fans in attendance. 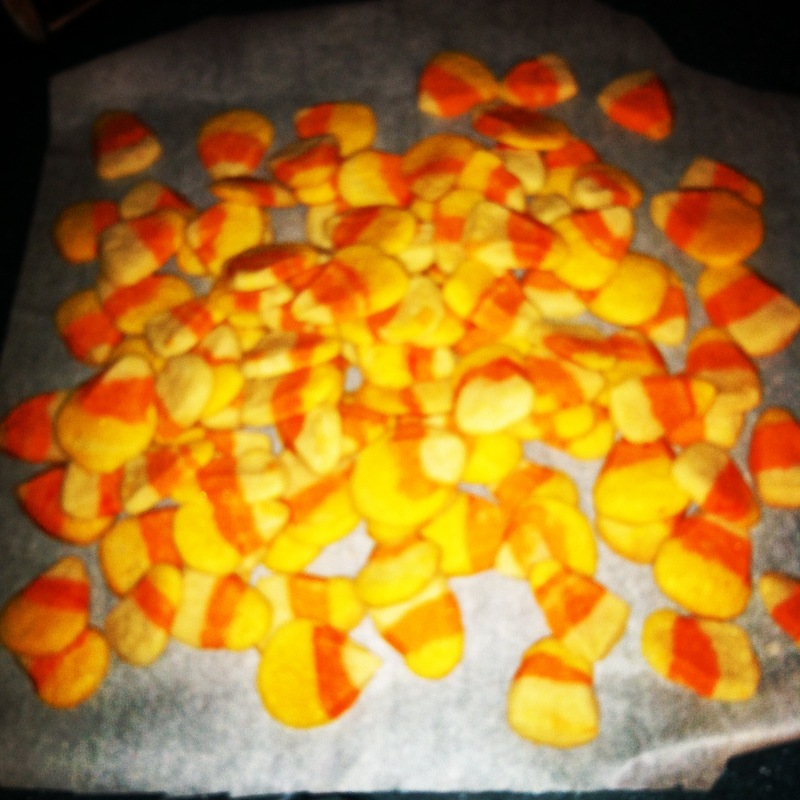 I started with the candy corn cookies. These are a time-intensive sugar cookie, but so cute. The recipe also makes quite a few cookies, although they are small. Kids and adults alike enjoy this recipe. And as I mentioned, you get a lot of cookies from it. 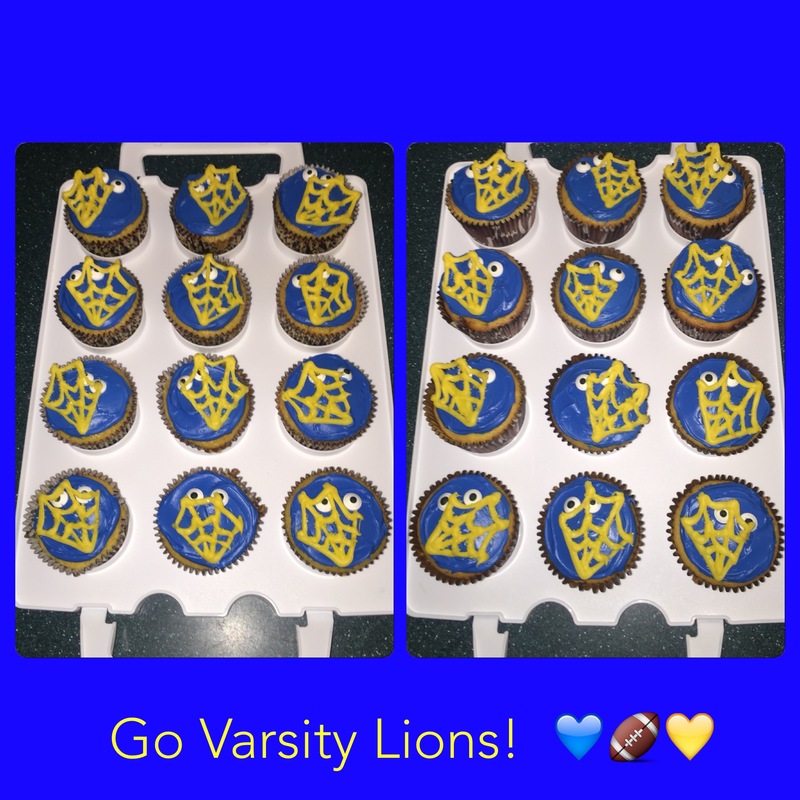 I also made cupcakes for the players and the coaches. I used a cake mix by Duff Goldman called Blue Suede. I agree with some of the Amazon.com comments that it isn’t royal blue like the packaging, but more like Tiffany blue. I purchased it at my local grocery store (Giant Food). There is a small food color packet inside, and it has a hint of blueberry flavor. I also have a blue velvet recipe I have used before. I added vanilla frosting on top, dyed golden yellow. I then drew circles on top with blue sparkle gel frosting. 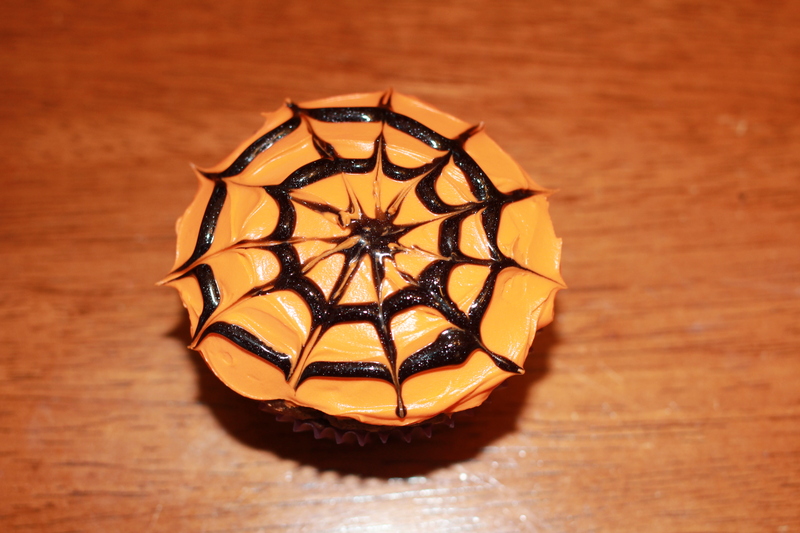 Using a toothpick, I made the spider web design so that the cupcakes were the team colors, but with a Halloween theme. I started running out of the blue sparkle gel, so the last 12 cupcakes just had blue dots on them. The boys won their game, and moved on to the semi-final game on November 8. More to come on that game soon! Each year at Halloween, I make treats for my co-workers. This year, I had found a new flavor of cake mix and frosting. I decided to give it a try for this treat. 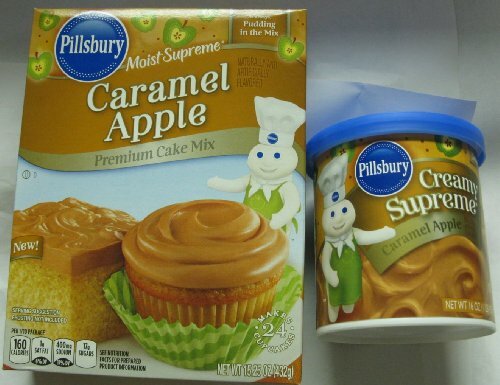 It’s caramel apple cake mix and frosting. To give the cupcakes a Halloween feel, I used Halloween-themed paper liners. I also made the spider web design on them using orange and black sparkle gel frosting. It’s a very easy technique. You make circles on the cupcake after you have frosted it, and using a toothpick, draw lines down from the center to the edge. One of my co-workers who tried the cupcake turned to me after a bite and said, “Oh. My. Damn.” I’m going to take that as a thumbs up for this effort and this flavor. 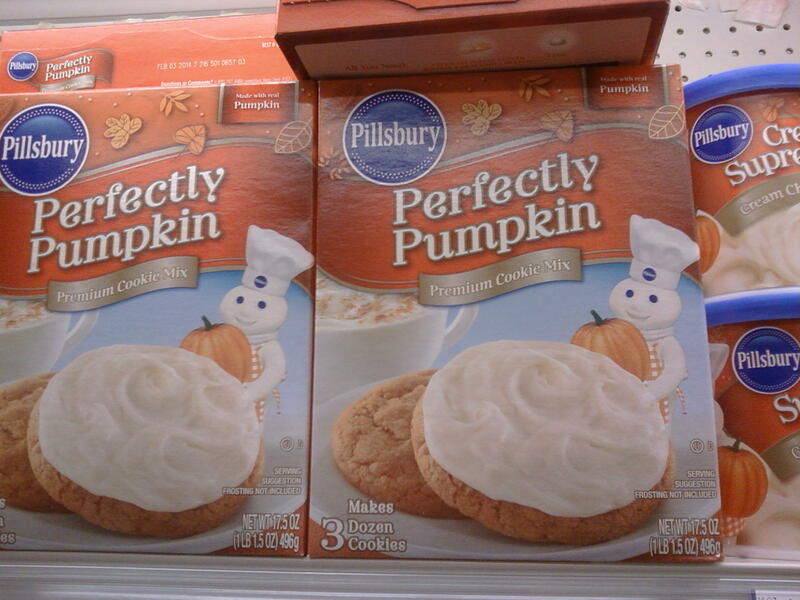 I also made some pumpkin spice cookies, with cream cheese frosting. This is a box cookie mix I found last year, and people love it. These cookies are soft and yummy, and the cream cheese frosting is a great compliment. 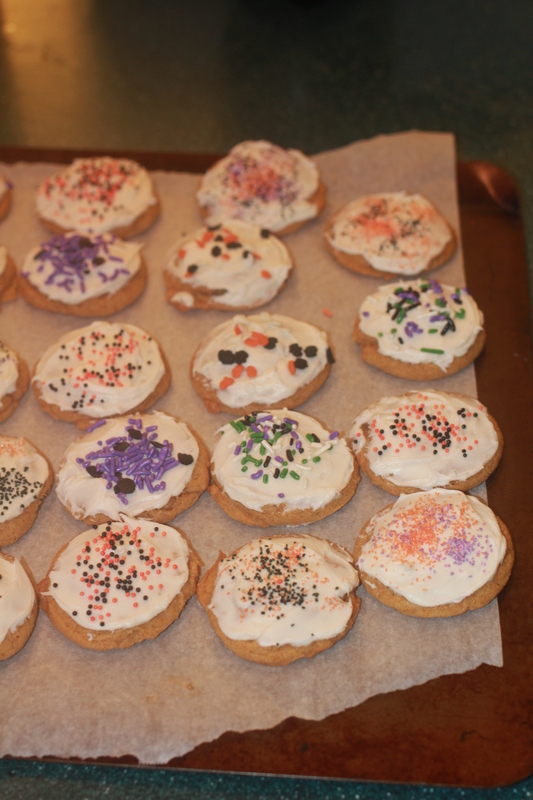 I made the cookies, and added Halloween-colored sprinkles on top. The cookies and cupcakes were gone before the end of the day. Can’t wait to try out some new recipes with my team as we head toward the year-end holidays. They are great taste testers! I was invited to a neighborhood Halloween party by one of the football moms from my oldest son’s team. 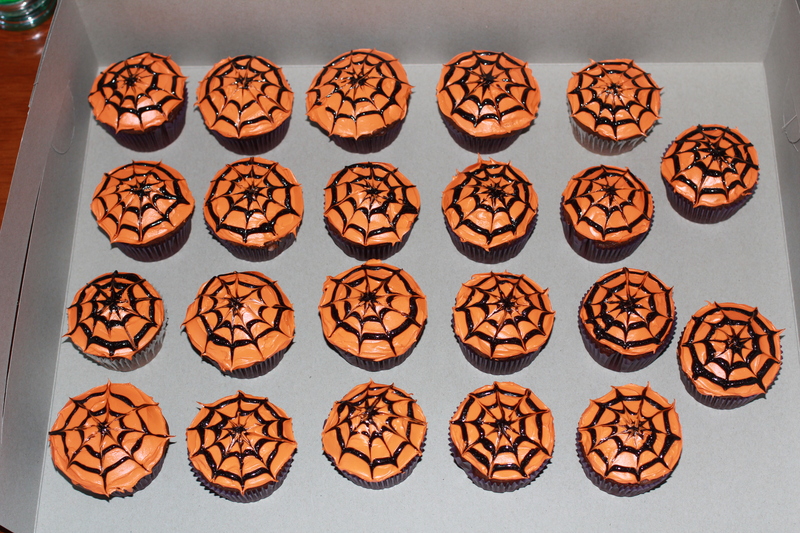 Since I never hit a party empty-handed, I decided to make spider web cupcakes. 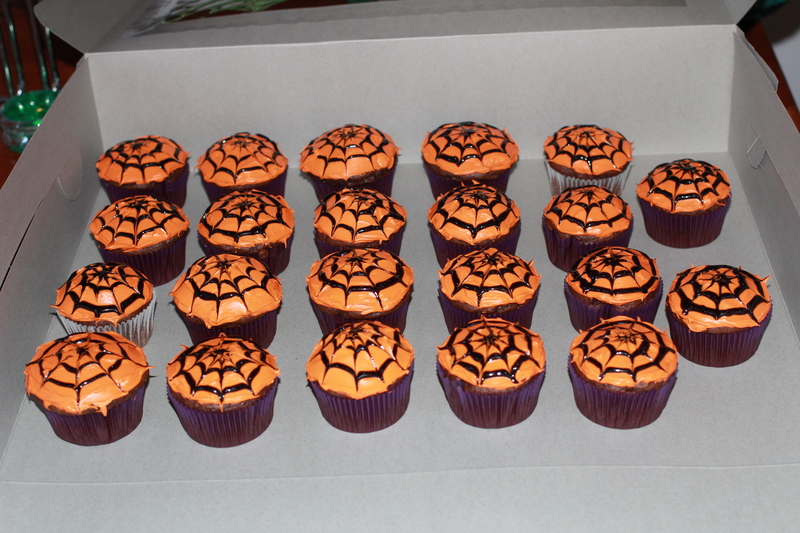 I used a devils food box mix for the cupcakes, with purple liners. I dyed vanilla icing orange, and frosted the cupcakes. Then I used black sparkle gel frosting to create the beginning of the web. I place one dot in the center, draw a circle around that, and another circle around that. Using a toothpick, I drag it through the icing from the dot on top down to the edge of the cupcake, making lines out from the center. I wipe off the toothpick between cupcakes.